This wallet is handcrafted by Chirada Loetparisanyu with cotton and leather. 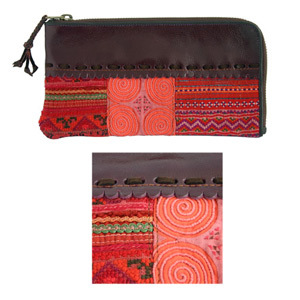 The front side features a band of embroidered hill-tribe patterns in red tones. 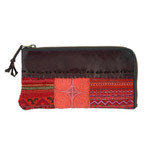 The velvet interior features a large zipped pocket for coins and two small slots for credit cards. The wallet closes with a zipper. Materials: Leather 50%, velvet (cotton) 40% and cotton 10%. This wallet is handmade by Chirada Loetparisanyu. She works from home in Chiang Mai.